My mom has been semi-conscious / unconcious for 24 hours. She went to sleep last night and never fully woke up. This afternoon she started calling for her mother in her sleep. "Mamma! come get me!!" she kept yelling over and over. My dad (at our urging) has started the process to put her in the nursing home. He just can't take care of her by himself. Even the hospice nurses are telling me the situation is not safe for either of them. And I agree, but I'm so upset to see her go in a home. It's such a sad, lonely, cold place. I can't picture my mom there. I can't picture her there, dying, all alone. We don't know what else to do at this point, though. Friday Clint took the day off of work so we could help my Dad with a few things. The plan was to rearrange my mom's bedroom to make it more accommodating for her wheelchair and easier to access the bathroom. We ended up not doing it because my dad was worried it would confuse her to have things in different places. Hospice is also pushing to put a hospital bed in there. My one complaint about hospice is that they can be pushy. They are wanting my dad to give my mom morphine around the clock, whether she needs it or not. It makes her SO sluggish and lethargic. She's supposed to get used to it after taking it a few times..... she looked REALLY bad and it made me think the end is near. Clint kept the kids occupied so I was able to spend a little quiet time with my mom. We got home just in time for me to get ready for mom's night out. I was in no mood to go, but Clint talked me into it. I met some friends for dinner at Cuco's in the mall and after we saw "Mama Mia" at the theater. I LOVE this movie! Very upbeat, which I was glad for. Saturday we played catch up around here and a few errands. I've really been neglecting the house with all the trips to Morgan City. We got the yard cleaned up and straightened up. A friend talked me into going to another mom's night out. I wasn't going to go since I had already had Friday night, but Clint said he didn't mind so I decided to go. Clint got the kids dressed and took them to town, so I had the house to myself to get ready. It was bunco night at someone's house. I'm not too crazy about bunco, but it was still fun. It helped that I won all the money, LOL! I won the most games, most buncos, and last bunco and came home with way more than the $5 i put up. Sunday, today, Clint stayed home with the girls and I went to my parents' for most of the day. My mom was much more lucid today. My dad hadn't given her any morphine. She was talking some and almost holding a conversation. It was nice to see some of the real her for a little while. I did some housework for my dad, and visited with my mom some. I came home and we took the girls outside and played and played with them. Clint commented today that I seem to be handling the situation with my mom much better than he thought. I don't know if I am or not. The shock has worn off some. Not that it's any easier, but I'm trying to be realistic. I know she isn't going to get better. In a few weeks, THIS will have been "good days" for her, so I know I need to spend as much time with her as I can. It's really sad how people have disappeared. My mom's own sister seems to have given up on her. They were so close and now she never calls to check on her or visits. I know it is hard to see someone you love in such terrible condition. I don't like seeing my mom this way either, but I'm still there and I always will be. I CANNOT believe how insensitive people can be. We went to a Family Night out with the playgroup last night. I figured we could all use a break and spend some time together. The plan was to meet at 6:30 at CiCi's Pizza, then afterwards head across the street to Chuck E. Cheese to play. Clint was home early, so we hung around the house (starving!) and waited until 6:30. When we got to CiCi's... The others had decided to go early already eaten and were LEAVING. One of the moms stayed and talked to us a bit. The other mom got up as soon as we sat down and walked out the door with out saying a word. Clint even asked me if we had run her off!! So we took our time and ate and Valerie was asking to go somewhere and play, so we went to Chuck E. It was complete chaos. Noise, kids running wild all over. Valerie wanted to climb on the play equipment and go down the slide, so I watched her for a little while. Some boys were up there, and they were playing "monster" and Valerie seemed ok, shrieking and laughing. I kinda wandered off to the side. Next thing I knew, I hear Clint hollering at some kid. Valerie's crying. An older little boy cornered her on the highest platform and would not let her get down. She was screaming at him. So he started HITTING her. REALLY HITTING HER!!! I was LIVID! Clint kept asking him who his mom was and telling him to come down. Clint kept getting louder and louder and people started coming over to see what was going on. Talk about a scene!! Finally the kid started yelling for his mom, and she came over and made him get down. Turns out it was HIS birthday party. The mom said something is wrong with his ears, and apparently Val's screaming hurt his ears, so he HIT her!!!! After that, we decided to just give up and come home. I finally was able to talk to my mom's pulmonary doctor who did the lung biopsy two weeks ago. What took so long for the results, is that he had them processed twice. Basically he got the results, and had them recut the slides and analyize them again. The official biopsy says "suspicious of malignancy." But the doctor said there is no doubt that she has lung cancer, which we knew already. He said we could redo the test, because in order for an oncologist to see her it has to be positive. He didn't recommend doing that. Radiation will not do any good. Chemo will not do any good. Considering how fast my mom declined.... the bone mets... and the probability of brain mets and others, he said sometimes doing nothing is the best choice. Hospice is the best choice. And I agreed, because what else could I do? There is no point in putting my mom through the stress of endless tests and treatments if there is no chance of a cure. She is so weak and so pitifully thin. I know she will never come back from this. The doctor said he couldn't pinpoint it, but just from looking at her and seeing how her condition was two weeks ago (she has gotten much worse) he didn't think she has much time left. So there we have it. We knew it, but I am glad in a way to hear it from a professional standpoint. No more second guessing. Hospice it is...until the end. I would estimate she's down to having weeks left. Not months... weeks. She doesn't talk much anymore. She barely interacts with me or the girls. She spends most of the day in bed, curled up in a ball. She's oh so very horribly thin. I sat with her today a good 20 minutes just holding her hand and she never said a word. This wasn't supposed to happen. This is not the way it's supposed to be. No one deserves to suffer like my mom is. Fading away... having cancer sucking the life right out of her. And there's nothing we can do.... nothing but watch her die. There are those that think my mom shouldn't have hospice. On the other hand, I keep hearing that it's great that we have hospice. Hospice is usually for those with 6 months or less to live. Is it great that my mom is nearly bed ridden, wheelchair bound, and can take a max of 2-3 shuffled steps? Is it great she no longer holds conversations? Is it great she can't read or write? Aldult diapers... that's great? She has trouble breathing? Barely eats?? I don't think anyone realizes how serious the situation is. How helpless.... how she is incapable of doing A THING for herself. Happy Birthday, Mom. I hope you enjoyed your day. Home health was supposed to start for my mom last week. They never showed. My dad called Monday and left a message. I called yesterday, and the hold up was paperwork. My friend Cherie is actually the Director of Home Health, and she told me she had to call the doctor's office 3 times to get the forms she needed. Cherie went to evaluate my mom yesterday, and she said home health will not be of much use to her. She suggested hospice since they could do a lot more. Cherie called my mom's doctor and the doctor agreed. Today the hospice nurse came to see my mom and decide if she qualified. Of course she did, considering all that is wrong. My dad signed all the paperwork, and starting tomorrow a nurse will go 3 times a week to check her. An aide will go 3 times a week to bathe her and tend to her needs. Every day someone will call, even weekends and holidays. We'll be assigned a social worker and there is a clergy person who visits. They are going to bring my mom oxygen. They can get a hospital bed when she becomes bed bound, which our guess will happen with in a month or two. They provide supplies like pain medicine, diapers, etc. Someone will be a phone call away 24 hours a day. All of this at NO charge. They take what medicare / insurance pays and you receive no bill. Amazing. I suppose that no matter which decision we make, we will second guess ourselves. Or there will be someone questioning it. "They" are only there for a brief half hour visit. They are not the ones who see how bad off she is all the time. They are not the ones holding the bucket so she can throw up because she can't walk to the bathroom. They are not the ones seeing how little she eats, how she struggles to catch her breath. They are not the ones who see her pain. Or how weak and shakey she is. And the confusion is so bad.... The reality is there is no sure cure for ONE cancer. We know my mom has two, three, maybe more organs affected. Perhaps treatment could slow it down and add a few more months, but at what cost? What would be the point of making her last days worse than what they are? The stress is really getting to me. My dad is pretty run down as well. I appreciate everyone who has shown concern for us during this time. I cooked Sunday dinner and brought it to my parents' house. Clint left right after lunch. The kids and I stayed most of the day. Before I got there, my mom called my Aunt and told her "I won't bother you anymore but I wanted to tell you the end is near." She is wanting a priest to come see her and give her the last rights. She told me she has been all alone dying for three days and no one has come to see her. Which is somewhat true. NO ONE has visited. All of her friends and her sister know how sick she is, but have yet to visit. I overheard her telling my aunt she had a "visitor." (She claimed it was a cousin we had a huge falling out with years ago who we do not speak to anymore - still living.) But this "visitor" was standing at the foot of her bed crying. Hallucinating? or... was it really a "visitor?" Someone from church came to give her Communion. She told my aunt there was a lady sitting across the street watching the house for two days. (another "visitor?") When she finally came to the door, it was to give her Communion. My grandma had "visitors" before she passed. I heard her say she didn't know what kind of arrangements we had made for her yet -- funeral arrangements. I asked her if she wanted me to contact one of her lifelong friends she has written letters to for years and years, and my mom said "no, she'll read it in the paper." She also told me to be sure to take care of my Dad... She wants hospice to come next week. It's rather difficult to sit back and watch this unfold. What do you say? What do you do? How do you come to terms with this?? She lays there just staring at me. Her body is probably ridden with cancer. Everything I've read said metastatic lung cancer is a death sentence. I've told my dad to watch out for seizures, which is the only sign of brain cancer she doesn't have. I don't understand why this had to happen. It just happened so fast and with little warning. You just never know... sigh. At times I think I'm ok. Then others I just fall to pieces. I keep thinking how it all makes sense now. All the pieces of the puzzle fit. My mom had all these little things wrong. Remember this post? The pre-cancerous tissue removed. The pain. The "asthma." All back to back in a short time frame. All minor on their own... but all together a sign of something going very wrong. Something big. No one put two and two together... no one saw this coming. The biopsy was this morning. I got up at 4am to be with my parents at the hospital. The optimistic doctor changed his tune after it was done. "It doesn't look good. I'm sorry." he said. Just from experience, he thinks the lung cancer is metastatic; that it spread to her lungs from somewhere else. Lung cancer. Bone cancer. And perhaps a third... and no one knows yet if it has spread to any other areas. The lab results will be in tomorrow or Monday, so we'll know what we are dealing with then. Type.... stage.... treatment? It doesn't seem real. How can this be? Why?? How can someone who NEVER smoked have lung cancer? I know it just happens sometimes... but still. Why did it hit her all of a sudden?? Even my dad said he didn't think he'd ever see my mom like this. Definitely not this soon. I am so lost. I just don't know what to do. I just don't understand why this is happening. I feel like the wind has been knocked out of me. I can't catch my breath. I went to the appointment yesterday. The first thing the doctor said was "I'm glad you all are here so we can discuss things." I knew then it was not good. The hot spots on her bones ... if not due to trauma, bone metasis was to be strongly considered. Meaning.... cancer elsewhere that has spread to her bones. Today she saw pulmonary specialist. He gave the impression that it isn't hopeless and it could still be nothing. It may not be as bad as it seems... I am not so sure about that considering the symptoms. She will have a procedure called a bronchoscope at 6:30am tomorrow morning. It will be several hours. Clint is going to stay home with the kids so I can be at the hospital. In February, Dr. Daniels told her she had ASTHMA. Just looked at her and said -ASTHMA!!!! And it would never go away. In February, she was WELL and ABLE and STILL MY MOM. Considering the shape she is in, now it may be too late. I do not know if she is strong enough to handle treatment, IF that is even an option. I just keep thinking that this is not how the story goes. This is not how her life is supposed to end. How can this be happening? Her birthday is on the 19th... will it be her last...? She is supposed to be here to watch my kids grow up. Veronica won't know her... Will Valerie remember her as happy and active... or will she remember her bed ridden, sick, slumped in her wheelchair.... or will she remember her at all? My mom's Thursday appointment was rescheduled for TODAY. The doctor's office called and told my dad she wanted to see her TODAY. I am not sure if that is good or bad. I woke up this morning to a Yahoo message from my dad saying my mom wanted to go to the emergency room, so he was taking her. That's it. I had no way of getting in touch with them. Yes, they have a cell phone but they are not the most tech savvy on how to actually USE it. I figured it would be hours before we knew anything, so I went to the gym and the store. Just as I was walking in, my dad was calling. The did NOTHING at the hospital. NOTHING. They went through the motions of getting through the ER, and all they did was send her across the street to the neurologist's office!! My mom had a 10am appointment today, so she would have been better off keeping her appointment rather than wasting HOURS at the hospital!!! I asked my dad what happened that made them go... My mom told him she thought she was dying, and my dad figured maybe she was, so he decided to take her just in case. So, at the neuro's office they were put dead last and had to wait until everyone else for the day had been seen. The neuro said it is not a nerve issue. He told them the bone scan showed 'hot spots' in several places. My dad asked what exactly was that, and the neuro said "something is growing in her bones, if you know what I mean." Her other issues are either spinal or brain related. SO once again... she has more appointments. Wednesday is a CAT scan of her head. Thursday she is seeing yet another doctor. Hopefully I can find a way to be there. SO, even after all of that... we still have no answers. And what little we do know is not good. I had a great day yesterday. Clint watched the girls and I had the whole day to myself to do whatever I wanted!! I saw a movie in the theater, which is something I miss doing dearly!! I saw "The Incredible Hulk." I really liked it! It's usually hit or miss with those comic book based movies for me. "Hulk" is really good though. Afterwards I did a little shopping. I went to Big Lots, and they have shelves of old Ekerd merchandise 70% off. I found Valerie a kid digital camera ($6), a webcam for me ($3), and a webcam for Clint ($6!) Then I went to Goody's, which is going out of business. I tried on a ton of stuff for myself, but nothing and I mean NOTHING fit (how did I gain so much weight!?? ), so I ended up buying Clint some dress slacks for work. On the way home I stopped at K-Mart and picked up some cheap $4-$5 shirts for myself. Even though I came home to a total mess at home, it was still so nice to have some time to myself. Summer before last our neighbors put their pool on the side of the road for garbage pick up. I knew there was nothing wrong with it so yes... I went after dark and dragged it to our house. (yes I can see your eyes rolling , lol!) It was one of those easy set pools... the big 15 ft x 4ft one. Clint found out that the pump had died, so they just threw the pool away. I figured it was worth the $50 to replace the pump for a free pool!! Soon after I was pregnant with Veronica and sick sick sick, so we never bothered putting it up. Clint found it in the shed a few weeks ago, and we decided it would be perfect for our 4th of July party. Thursday he cleaned it up, pumped up the top ring, and filled it about half way up so it wouldn't be too deep for the younger kids. Val had the best time playing in it. It must have been gigantic to her as it seemed so big even to me. We had to bribe her to come in for lunch. After lunch, we were going back out to play and (surprise) the side seam had BUSTED and it was flooding our yard!!! All that water wasted!!! And I SO was looking forward to getting in it to cool off. Clint talked me into going buy one of our own. He got the small easy set- 10ft x 30 in. It's about the size of a hot tub, lol! Just big enough for us to get in and sit. So now we have our own pool to relax in and get some relief from this awful heat!! We had a nice day over all. Our party was a lot of fun and it was great to see everyone. The babies are SO big!! Thanks to all who came and helped with the food. The kids had a blast. My house is a disaster but I guess that means we had a good party, haha! Has it really been eight years? On July 3, 2000 Clint and I met. I remember it as if it were yesterday. It was late afternoon and we were chatting on ICQ. We had been chatting and emailing daily - sometimes all day - for about a month. Clint asked me to meet him at Pepper's in Thibodaux for pizza. I debated for a few minutes. I even went to his webpage to look at his 'big guy scary' pictures. I told my mom and she told me to go and get out of the house. He gave me his phone number and I called him. We talked about our pets and I was surprised to find out he had a bunch of cats. I also don't think realized until that moment that his mom lived with him. We decided on 8:00 to meet. I got there first. I think I was the only person in the place. Clint walked in a few minutes late and there was no doubt who he was, LOL! His head was shaved which was a surprise. I remember thinking "he didn't tell me he shaves his head!!" He had a bit of hair in all the pictures I had seen, Clint had on a black Taz shirt and blue jean shorts. He carried a green insulated lunch pack, which I soon learned held all of his diabetic medicine. We sat and talked, and ate a weird chicken pizza. Then we walked across the street to Bullwinkles (now Last Call) to have a few drinks. It was DEAD. There was like 3 people in the whole place. Someone mentioned the Chee Weez were at the Abyss (closed down years ago!) in Houma. So we headed that way and stayed until 2am. At one point Clint left (bathroom break I think) and some guy started chatting me up. Asking me all sorts of questions....and I was nice and talked to him. To me it was pretty funny since it was very obvious I wasn't there alone since there was an empty chair right next to me. The guy took one look at Clint when he returned, and just walked away almost in mid sentence! LOL!! If you had asked me then if I thought we'd be here 8 years later I would have said you were out of your mind!!! I didn't even think I liked him after that first "date." Ha! Every night after I read Valerie a bedtime story, we lay in her bed and "talk." She usually wants me to tell her about something we did - vacations, zoo trips, etc. I started asking her what was the best and worst thing about each day to start a different conversation. Today we were at my parents' house and Val was not having a good day. In trying to distract her, my dad and I were trying to get her to sit on the couch so we could talk. Side note... my mom has a very old dog named Buddy. 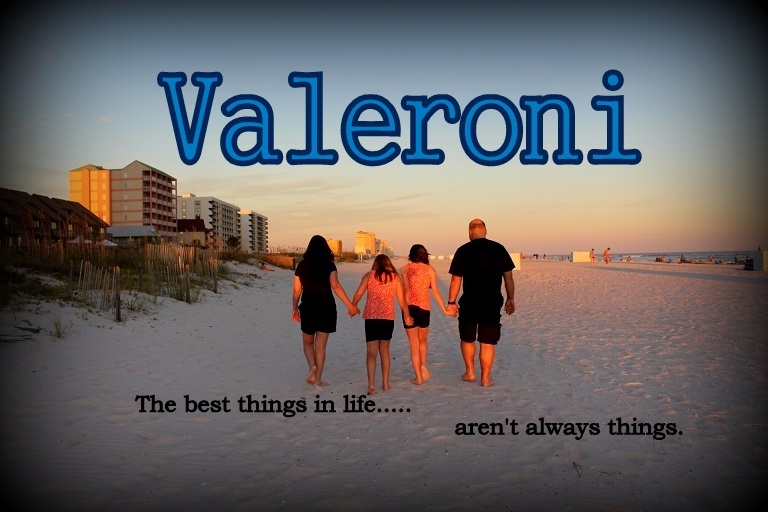 My dad asked Valerie to tell him the best/worst thing about today. "The worst thing is smelling Buddy! ppeeeeeeuuu!" while pinching her nose.